Economic growth requires energy. 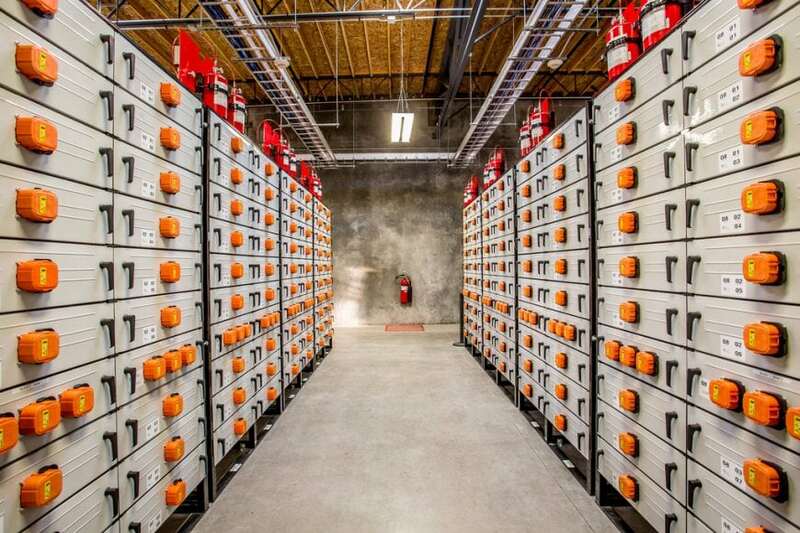 To support future U.S. economic growth, pursue national energy independence and reduce greenhouse gas emissions, development of advanced energy storage technologies is the key. Li-ion battery is a type of energy storage device that is capable of storing a relatively large amount of energy per unit weight, i.e., specific energy, compared to nickel-metal hydride batteries. Current lithium-ion batteries use graphite as the anode material and can reach a specific energy of 250 Wh/kg. A very promising direction of further improving the specific energy of lithium-ion batteries is to replace the graphite anode with metallic lithium. This will double the current specific energy. Therefore a lot of research in the lithium-ion battery field is dedicated to enabling metallic lithium as the anode material. However, there are significant challenges associated with metallic lithium anode. Traditional lithium-ion batteries use flammable organic liquid electrolyte soaked in a thin porous membrane (called the separator) for separating the cathode from the anode and for lithium-ion transport. Traditional liquid electrolytes are not suitable for metallic lithium anode as side reactions and lithium dendrite growth will lead to decreased cycle life and even dangerous situations such as thermal runaway and battery fire. Solid electrolytes are a promising alternative to flammable liquid electrolytes for high-energy lithium battery applications and have two important classes: polymer electrolytes and ceramic electrolytes. Polymer electrolytes are usually stable against metallic lithium. Their mechanical flexibility provides resistance to fracture and accommodates volume changes during cycling. They also form relatively good adhesion to electrodes. However, they suffer from low room temperature lithium ion conductivity (<10-5 S cm-1) and they are mechanically too soft to stop lithium dendrite growth. The most widely used polymer electrolytes are formed by dissolving lithium salts in poly(ethylene oxide). Ceramic electrolytes have the mechanical rigidity to withstand lithium dendrite growth with ample lithium ion conductivity. However, they suffer from poor processability as they are highly brittle. Our strategy to stabilize metallic lithium is to make a composite of a polymer electrolyte and a ceramic electrolyte wherein the ceramic loading is high enough loading to provide good conductivity and mechanical modulus, with just enough polymer electrolytes to provide adhesion and processability. Our target loading is 50 vol% ceramic. This is much higher than most studies on polymer-ceramic composite electrolytes. Figure 1. Spray-coated polymer-ceramic electrolyte membrane and their lithium-ion conductivities. Reproduced with permission from Elsevier. To fabricate composite solid electrolyte with a high ceramic loading, we discovered that spray coating from an aqueous slurry consisting of a mixture of polymer, lithium salt, and ceramic produces very uniform, crack-free and large-area membranes (Figure 1). During spray coating, discrete ceramic particles coated with polymer electrolyte are delivered as droplets through the spray nozzle onto the substrate surface. Each layer is dried for a minute before spraying the next layer on top, thus ensuring no solvent bubbles as well as maximizing the surface area for solvent evaporation. Moreover, using water as the carrier solvent is easy for scaling up and is environmentally friendly. After spray coating, the composite membranes were hot-pressed, and the density of the membranes could reach the highest theoretical density. We compared the membranes made with this method with other methods, such as dry mixing and solvent casting, and the spray-coated membranes had one order of magnitude higher conductivity than other methods. To further improve the ionic conductivity of the membranes, we added a plasticizer, tetraethylene glycol dimethyl ether, known as TEGDME, or tetraglyme. It is a small molecule that can soften the polymer and improve ion transport in the polymer phase. Another 5-fold increase in conductivity was achieved by adding TEGDME. Our best-performing composite membrane has a room temperature ionic conductivity of 10-6 S/cm, three-fold higher than polymer electrolyte without a plasticizer and with much higher mechanical modulus. However, we are left with one challenge: the interface between the polymer electrolyte and the ceramic electrolyte was very resistive, and the ionic conductivity of the composite electrolyte is still too low. This is a central challenge to be resolved by researchers in the composite electrolyte field. Further investigations are being carried out in our lab to understand and tackle this problem. These findings are described in the article entitled Facile and Scalable Fabrication of Polymer-Ceramic Composite Electrolyte with High Ceramic Loadings, recently published in Journal of Power Sources. This work was conducted by Amaresh Samuthira Pandian, X. Chelsea Chen, Jihua Chen, Bradley S. Lokitz, Rose E. Ruther, Guang Yang, Jagjit Nanda, Frank M. Delnick, and Nancy J. Dudney from Oak Ridge National Laboratory, and Kun Lou from the University of Tennessee, Knoxville. The investigators appreciate support for this program by the Advanced Battery Materials Research Program (BMR), led by Dr. Tien Duong, of the DOE’s Office of Energy Efficiency and Renewable Energy. Xi Chelsea Chen is a researcher is a postdoctoral fellow at the University of California - Berkeley. Their research focuses primarily on X-ray and neutron scattering.